Thousands of public school teachers voluntarily leave their jobs each year, hurting student achievement and costing districts billions of dollars to find replacements. Lynnette Mawhinney and Carol Rinke were once part of that churn (full disclosure: so was the author of this article). 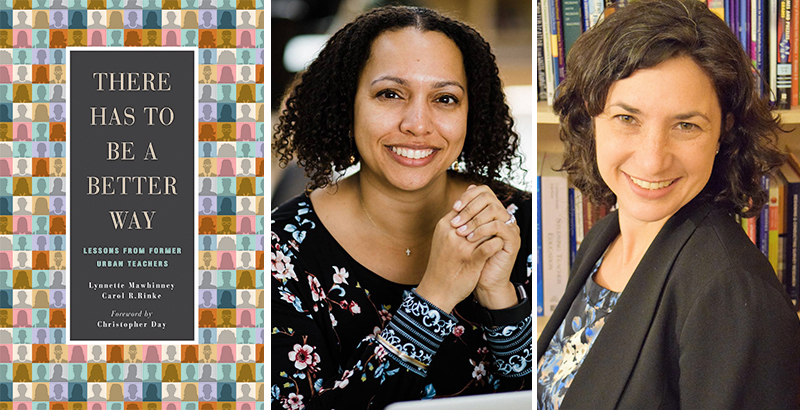 Now, with both women serving as professors at teacher prep programs, Mawhinney and Rinke have co-authored a new book that illuminates the many reasons teachers leave the profession and offers recommendations on how to stem the tide. The book, There Has to Be a Better Way: Lessons From Former Urban Teachers, published by Rutgers University Press, is based on in-depth interviews with 25 former teachers from around the country who left the classroom on their own terms. Citing research that nearly half of all new teachers leave within five years, the authors tried to find the stories behind the statistics, focusing on teachers at high-poverty, high-minority, urban schools that suffer from frequent turnover. All of the former teachers interviewed, whom the authors term “teacher leavers,” taught in the greatest-need areas of secondary science or English. Aspects of the book reflect the deep demoralization and cynicism of some teacher leavers. “It was insane and I just felt like I was abusing students because I was testing them so much,” said one teacher, adding that the 13-year-olds had “been through all these tests and they were sick of it and I was sick of it.” “The system is so broken, and I’m overworked, and I’m underpaid,” said another. “We were doing more harm than good,” said a third. The authors attempt to lighten the book’s tone by closing out each chapter with recommendations for policy changes to increase teacher retention. The ideas range from the more conventional — urging administrators to explicitly discuss different racial experiences — to uncommon, like pushing districts to shut off their servers evenings and weekends to force teachers to take a break — but they have the intended effect of making the book more of a constructive resource than a depressing screed. The book builds off of studies by University of Pennsylvania professor Richard Ingersoll and organizations such as the Learning Policy Institute. Given the focus recent teacher strikes have placed on inadequate salaries, it is noteworthy that only six of the 25 teachers interviewed mentioned pay as a reason for leaving. What’s more, “some teacher leavers have indicated greater satisfaction with their careers outside the classroom, even when their salaries are lower,” Mawhinney and Rinke write. Part of the book’s value is its ability to add nuance and personal detail to an issue often lost in the mire of national statistics. But the book is not without its flaws. Its sample is inherently limited, as the authors concede, and other stakeholders involved in teacher retention, such as teachers unions, are curiously absent, particularly since research shows that key features of career satisfaction — autonomy and control — run counter to what unions typically advocate for: uniformity. Furthermore, the teachers sampled offer 18 different ways in which their post-teaching jobs offer them more satisfaction than teaching. The only areas in which they are less satisfied — benefits and job security — are ones that unions have traditionally made their own. However, the authors do not call on unions to prioritize increasing teacher retention, such as by using mentor teachers or offering sabbaticals, which some schools in England have tried. All told, There Has to Be a Better Way stands as a useful resource for district administrators and higher-education officials at teacher preparation programs, not to mention teachers themselves.